Stomach pain from too much quinoa may be caused by various reasons and should be discussed with your doctor. 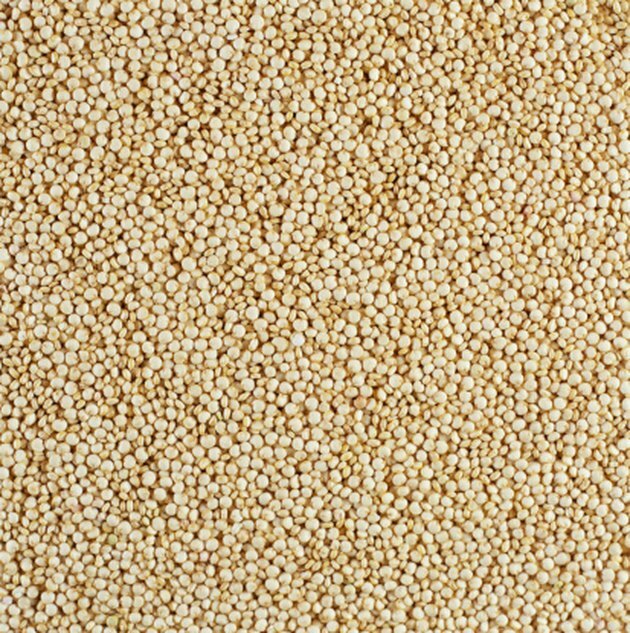 Quinoa is a naturally gluten-free grain that is high in protein and fiber which could cause stomach pain after you eat the grain. Any food can cause adverse reactions because of an allergic reaction or intolerance. If the pain is severe, it may be a sign of a more serious condition. Avoid eating quinoa until you can talk with your health care provider. Quinoa contains 10 g of dietary fiber per cup. Considering that the average adult is recommended to consume between 20 and 35 g of fiber daily, one cup provides a substantial amount. If your body isn't accustomed to a lot of fiber in your diet, eating a lot of quinoa can lead to gas, bloating and stomach pain. Too much fiber can cause increased gas and abdominal pain because the bacteria in your colon isn't used to digesting the amount of fiber in quinoa. Avoid high fiber foods for a few days to see if your stomach pain subsides. It's possible to have an intolerance to any food. Stomach pain is one of the most common symptoms of intolerance because your body has difficulty digesting the grain. When you ingest quinoa, your digestive system cannot digest the proteins, carbohydrates or sugars in the grain, which leads to inflammation and discomfort in your abdomen. You may also develop bloating, nausea, diarrhea, vomiting, cramping and gas from intolerance. You may have an allergy to quinoa. Any time your immune system mistakenly identifies a protein in food as dangerous, you will develop an allergic reaction. While quinoa is not considered a common food allergen, if your immune system overreacts to the proteins in the grain your body will release disease-fighting agents called antibodies. These antibodies trigger white blood cells throughout your body to produce histamine. Histamine in your stomach and intestines causes inflammation and swelling, which leads to pain in your digestive system. The only cure for a food allergy is to eliminate the food from your diet. Chronic stomach pain is alarming. Stomach pain that lasts for more than seven days may be sign of a digestive disease. Common disorders that cause stomach pain include Crohn's disease, irritable bowel syndrome or ulcers. If you notice blood in your stool or vomit, call your doctor immediately.